Working in the cloud... wherever you are, whenever you want. With the TSplus Remote Desktop app, your Windows Applications are available anywhere in real time, simply by connecting to Wi-Fi or the Internet. The App can build up any number of connections simultaneously to different sites and servers. With just one click, you are connected to the server in New York; with another, you start your CRM in Los Angeles. From smartphone to tablet and up to workstation - all end devices are compatible with the same unlimited functionality for the same operations. TSplus Apps are available for all major operating systems as web or native apps. After a quick download, your devices are ready for use within a few minutes. Whether on your desktop or mobile device, the apps are a gateway to each TSplus system. With the click or touch of a button, you are connected to a TSplus server where you can use the assigned programs, such as QuickBooks, SAP or Office, in real time - wherever you are. The host site must be a TSplus Web Mobile or Enterprise system: Buy a Mobile Web or Enterprise Edition or Upgrade your Edition. The 11.20 release (and over) must be installed on this host. After a short download, your devices are ready for use within a few minutes. Whether on your desktop or mobile device, the apps are a gateway to each TSplus system. With the click or touch of a button, you are connected to a TSplus server where you can use the provided programs, such as QuickBooks, SAP or Office, in real time - wherever you are. Using the free TSplus App, save your company money by paying for only one TSplus license and access your servers from as many devices you wish! You can use all your business apps anywhere, at any time. 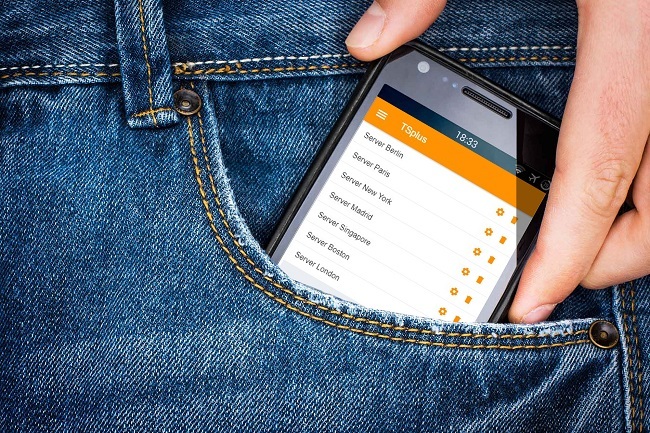 Whether at your workplace, from home or in between... with the TSplus App, you always have a secure connection to your data via desktop, tablet or smartphone. Even when your employees work outside, your data never leaves the building. Everyone works with your applications via an encrypted data connectionenabled either locally at your company or at a data center, without storing any data on end devices – making remote work as safe and secure as in the office. 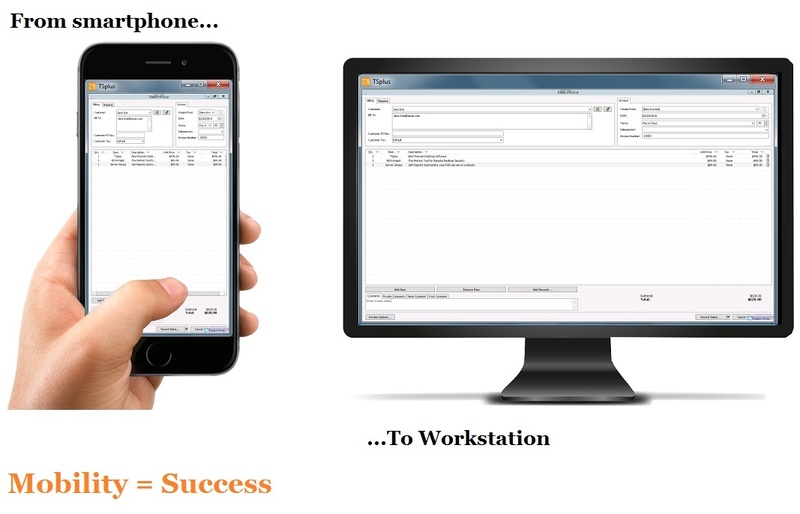 Work whenever and wherever you want... with your TSplus App, business services or administrative tasks are no longer bound by any location. Read your files in your home office, have business reports written by employees at home, and outsource tasks at peak loads to other service providers. Where time meets business, the TSplus App is a "must-have". Flexible working hour models... means easier access for staff. From the administrative assistant with a long commute to the consultant who starts family planning - you can now offer a working time model that fits precisely into their lifestyles. Download: Access a Remote Server from your mobile device now! The TSplus App is free for TSplus Mobile Web Edition and Enterprise users. TSplus App latest major release. With the TSplus App, access your applications and Remote Desktop server today! Question: What are the default setting I should use for my TSplus App? The TSplus App is using your TSplus Web Server to connect. For example, if the IP address of your TSplus server is 192.168.1.120, With your web browser, Chrome for example, you will type http://192.168.1.120 and you will see the TSplus Web Portal display within Chrome. In such case, it is the same IP that you will to use for the TSplus App. Question: I have typed the correct IP address of my TSplus server, BUT, I cannot connect. Why? Probably, your TSplus web server HTTP port number is not the port 80 but something else, for example port 8080. Verify this point with your AdminTool and edit your TSplus App setting to add the proper port number. Question: What about Use SSL and IP address? To understand this point, just use your web browser, Chrome for example. What will you see when you add "https" before your server IP address, for example: httpS://192.168.1.120 ? By design, SSL certificates are bind with a domain name. This requirement applies to the TSplus App when using Android or IOS. The TSplus App will not receive back the expected SSL certificate and the connection will not possible. For your information, we developed a work-around on this specific point for the TSplus App Windows version. Question: I am using my Domain name to access my TSplus server, for example demo.tsplus.net. However, I cannot connect. Why? If you want to Use SSL, or when your domain web server enforces the HTTPS protocol for security raisons, your SSL certificate must be a certified one. If your domain name SSL certificate is not a certified on, the TSplus App will not be able to start the connection. In such case you must enter your domain name with Use SSL unchecked. Question: Does the printing option work on that app? Yes, you can print by using the Universal Printer.